Air quality monitoring is an interesting topic to explore with the rises in pollution, allergy sensitivity, awareness of health & fitness, and technology innovation. The consumer marketplace has seen innovative products released bringing more awareness to air quality monitoring in the home. One such product is the smart scale. These smart scales monitor a variety of health related parameters and also the air quality. The air quality is sent to the cloud and an app can alert you to the changes in the air quality so you will know when an area needs ventilation with fresh air. Having an awareness of the air quality could allow for an improved quality of life. This article shows a method of exploring air quality monitoring by measuring carbon dioxide, volatile organic compounds (VOC), and dust levels using the Arduino* ecosystem and sending the data to a cloud service provider. 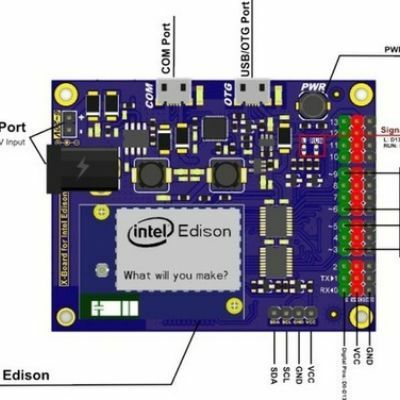 The Intel® Edison platform is a natural fit for starting a new prototype or migrating an existing one given its fast processor, large memory size, and integrated connectivity for WiFi and Bluetooth. 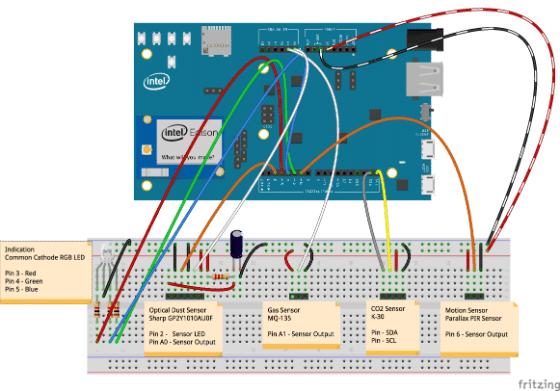 The Arduino ecosystem provides a capable set of hardware and firmware libraries to experiment with using the Intel® Edison Compute Module and Intel® Edison Arduino Breakout Board. Figure 1 shows the hardware component connections to the Intel® Edison Arduino Breakout Board. The system uses an RGB LED as a simple visual indication system for displaying the air quality. 1. An optical dust sensor is used to measure the dust in the area. 2. A gas sensor is used to measure the Volatile Organic Compounds (VOC) such as smoke. 3. A CO2 sensor is used to measure the carbon dioxide levels with an I2C interface. In addition, a motion sensor is used for helping the system get the best representation of the total air quality in an area, by filtering out temporary increases in dust concentration caused by movement, and temporary increases in CO2 concentration caused by a person breathing close to the sensors. When there is no motion detected, the firmware reads the air quality sensors, analyzes the sensor data, updates the visual indication system, and sends the air quality data to the cloud. The details of the system are further discussed in the Firmware section. The following code shows the includes, macros, and functions for the air quality system. Functions for Initialization, Main Loop, Reading Motion Sensor, Reading Air Quality Sensors, Analyzing Total Air Quality, Updating Visual Indication LED, and Sending Data to a Cloud Service Provider are discussed. Initialization: This function initializes the serial debug interface, the I/O pins, and the I2C interface. Main Loop: The main loop initializes the system, checks for motion, reads the air quality sensors, analyzes the total air quality, updates the indication LED, and sends the data to a cloud service. Reading Motion Sensor: The motion sensor is read by sampling the sensor’s digital output pin. If motion is detected, the sensor output pin will go HIGH. The function attempts to filter glitches and returns whether motion was detected or not. Reading Air Quality Sensors: This function calls the individual gas, co2, and dust sensor functions. The function takes a pointer to integer array for storing the air quality results for each sensor. Reading Gas Sensor: The gas sensor can detect gases such as NH3, NOx, alcohol, Benzene, and smoke. The gas sensor contains an analog voltage output that is proportional to the gas levels in the air. An A/D conversion is performed to read this sensor. The function reads the sensor, averages the readings, analyzes the sensor data, and returns the air quality for this sensor. Reading Dust Sensor: The dust sensor contains an optical sensing system that is energized using a digital output pin. An A/D conversion is then performed to sample the sensor’s analog voltage output that is proportional to the dust in the air. This function reads the sensor, averages the readings, analyzes the sensor data, and returns the air quality for this sensor. Reading CO2 Sensor: The CO2 sensor returns a CO2 concentration level in parts per million (ppm). The CO2 sensor is read through the I2C interface. This function reads the sensor, averages the readings, analyzes the sensor data, and returns the air quality for this sensor. Analyzing Total Air Quality: This function determines the total air quality for the area by analyzing the gas, co2, and dust air quality values passed to this function. The function returns the total air quality level for the area. Updating Visual Indication LED: This function updates the indication LED to the appropriate color for the air quality value that is passed to this function. The LED turns blue for optimal air quality levels, green for good air quality levels, and red for bad air quality levels. The LED turns magenta if motion is detected. In this example, xively.com is used as the cloud service provider that the air quality data is sent to. Figure 2 shows an example feed with four channels. The channels are further discussed in the Functions section. Integration with xively.com requires the Http Client and Xively libraries added to the Arduino IDE. Please see the link below to learn more about xively.com, creating an account, Arduino tutorials, and library integration with the Arduino IDE. The following code shows an example of the includes, macros, and functions that can be added to the air quality system to add xively.com support. Updating the data stream: This function is called to update the values for a xively.com channel datastream. The function is passed the channelID, and the datastream value. In this system as shown in Figure 2, four datastreams are used. The datastreams are updated with raw sensor data from the gas, co2, and dust sensor functions. In addition, a datastream is also updated in the main loop with the total air quality value. Sending the Datastreams to Xively: This function performs a PUT operation to a xively.com feed. The function returns the status of successful or the error code. The main loop calls this function. 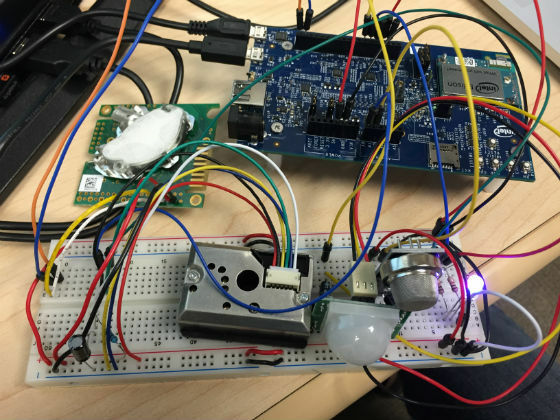 Hope you enjoyed exploring air quality monitoring with the Intel Edison platform. Challenge yourself to add additional indication showing the status of each sensor, to add enhancements to the cloud service experience with alert triggers when the air quality changes, and also look for opportunities to integrate air quality monitoring with other systems. IS AIR STERILIZER (HYGIA) & AIR PURIFIER OF SEVERAL BRANDS REALLY WORKS?